In a large pot, heat the olive oil. Add the carrot, celery, onion and garlic and cook over medium heat, stirring occasionally, until softened but not browned (about 10 minutes). Add the pancetta and chicken and cook until chicken is no longer pink (about 8 minutes). Add the tomato paste and cook over low heat, stirring occasionally, until shiny and rust coloured (about 8 minutes). In a large pot of boiling water, cook the pasta, stirring often, until al dente. Drain the pasta and put it back in the large pot. Add the sauce and half the Provolone or Italian cheese blend to the pasta; stir until well mixed. 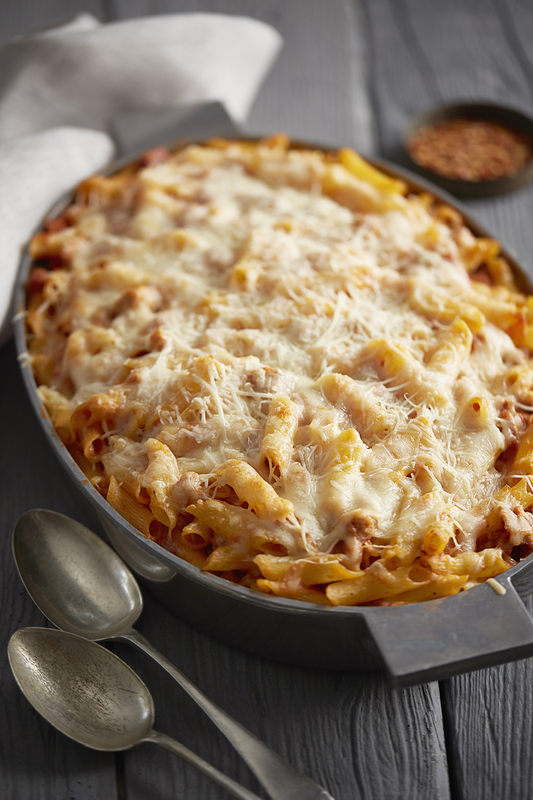 Transfer the pasta to individual oven-proof dishes, or one 3-quart casserole dish. Top pasta with the remaining cheese and the parsley; bake for 20 minutes until cheese is melted and bubbly. Serve with green salad.